Updated April 26 and October 2, 2012, June 4, 2013, and March 25, 2015. In some ways the Haunted Mansion has been a very conservative institution. Despite all of the changes over its four decades, the number of ghosts that have been eliminated from the show outright is surprisingly small. Today I'm blogging about one of those. He's not as well known as the Hatbox Ghost or April-December, but he's still worth a post, and this is it. 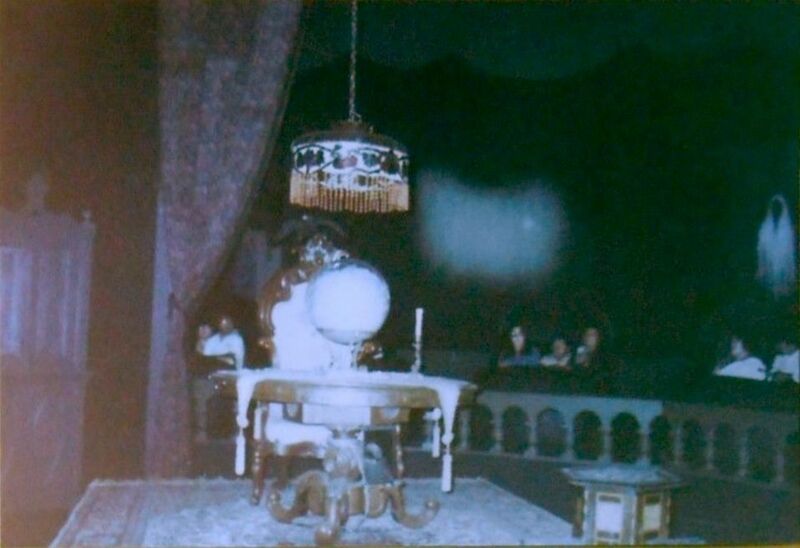 In the previous post, I mentioned that no ghosts in the HM are visible to the eye until you get to the Séance circle, where Madame Leota apparently helps them get their mojo on, and they materialize. 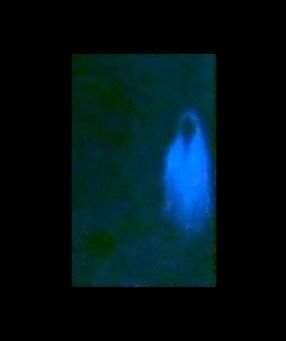 Just for kicks and giggles, which ghost is the first to do so? After all, if our earlier analysis is correct, this is a thematically significant point in the show, and the first visible manifestation of a ghostly form should be a point of interest. Until 2001, it was an easy question to decide who was first. Now, not so much. 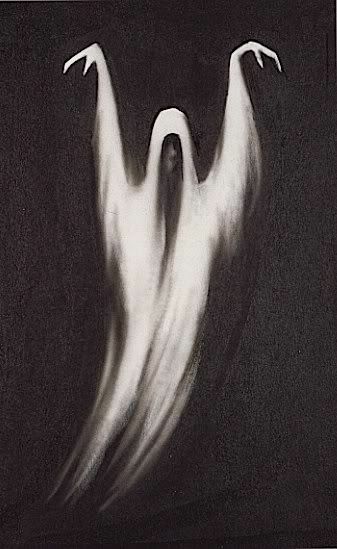 In the original 1969 Séance circle there were only three visible ghosts. 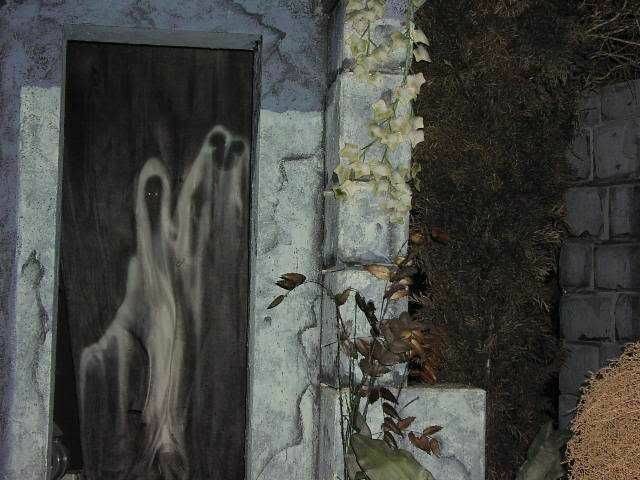 There was Mdm L herself, there was the greenish ectoplasmic ball floating around above the doorway by which you enter the room, and there was the one I call Purply Shroud, for want of a better name. 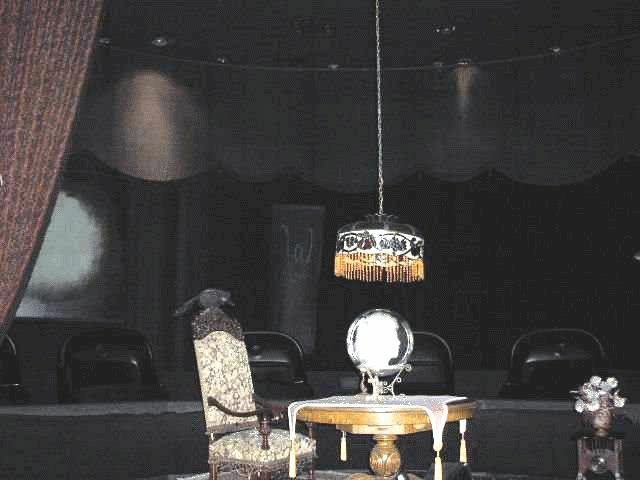 The Madame is still there, of course, and so is the ectoplasmic ball, although at DL they introduced some eerie faces into its ectoplasmic trails a few years back. Since Mdm L obviously doesn't count as one of the ghosts having trouble getting through, and since the ectoplasmic ball is only marginally classifiable as a visible ghost (at least it was until it started making faces at us), it follows that Purply was the first to unambiguously assume a visible ghostly form. But he's gone, and I'm surprised at the number of longtime HM fans and ordinary Disneylanders who don't remember him at all. I always liked him. You can see what he looked like in the reconstruction above, a shrouded figure similar to the one in the crypt in the graveyard, just before the opera couple. The effect is produced by a fan blowing on a piece of silk upon which the figure is painted in fluorescent paint. In regular light they look white, but under black lighting they glow. In the Séance circle it glowed as a deep, dark purple. He was to your left as you entered the room, but you never saw him at that point because of the angle he hung at and because your doombuggy faces the other way. You first saw him across the way as you swung around, about half way through the room, in much the same way as you first take note of the ecto ball. You see what happens, kids? 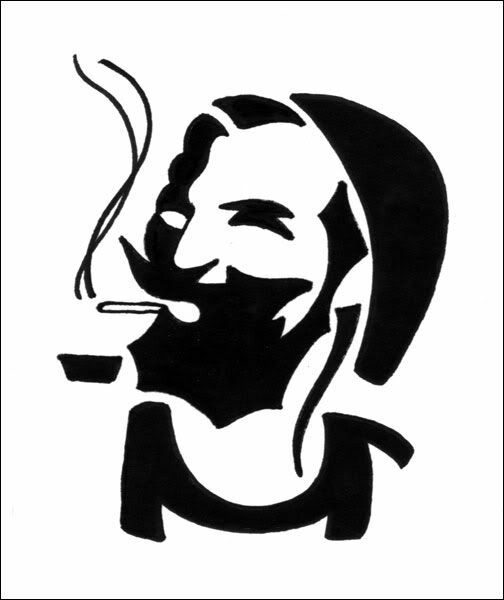 Smoking will kill you. Until June of 2013, if you wanted to see the DL original, all I had to show you was the pathetic smudge in these March 1994 video grabs. Yet another good photo came to light in March of 2015. This one was taken in 1980, and the most interesting thing about it is that the design of Purply seems to have changed. His raised arms appear to be gone. 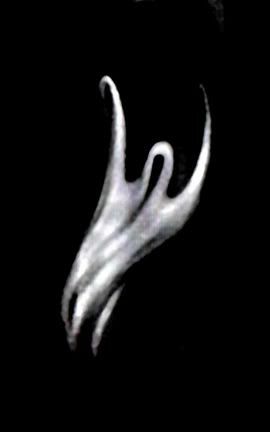 He resembles very closely the shrouded figure in the graveyard crypt. Tokyo version. 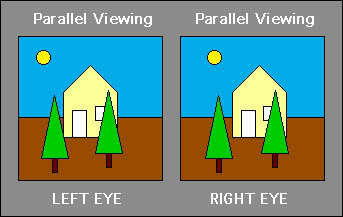 With its sense of three-dimensional space, this is very much like what I remember. They took Purply down for the first "Nightmare Before Christmas" overlay in 2001 and as far as I know never put him back up. For those who dislike the NBC overlay (aka HMH), this is one more reason to nurture your resentment. 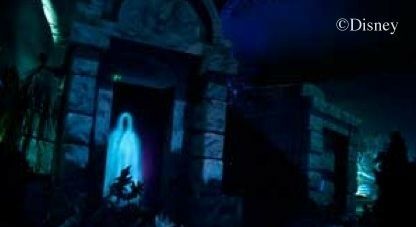 It's kind of shabby treatment for the first ghost with the savvy to take advantage of Madame Leota's administrations. *bangs fist on table* It's a dirty rotten shame, that's what it is. Excellent post, and I didn't really remember "Purple Shroud", sadly, from riding HM before 2001..but then, not the most "showy" spectre it would seem. Great info and documentation! Bring back The Hatbox AND Purple Ghosts!!! I cannot believe I forgot about the purple ghost! Shame on me! 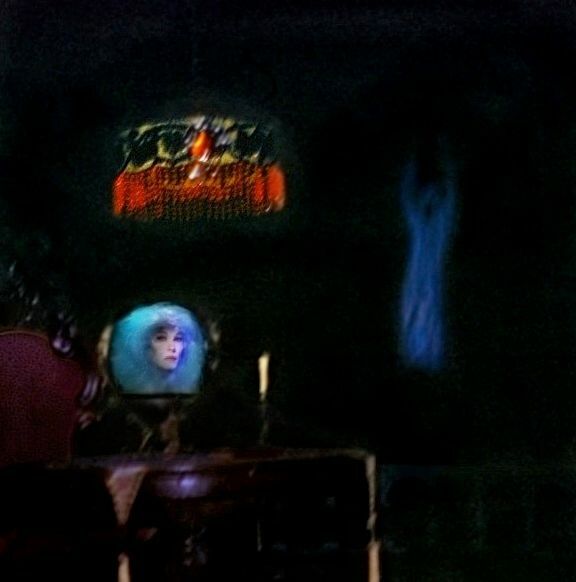 As I've mentioned before in MiceChat, after decades of visiting Disneyland's Haunted Mansion, I noticed the crypt ghost only after seeing it first among your posted images. Save for the obvious Mickey, were one to envision actual spirits in the classic (perhaps, literary?) sense, I believe that this is how'd they look. Yes, these shrouded ghosts are very traditional. 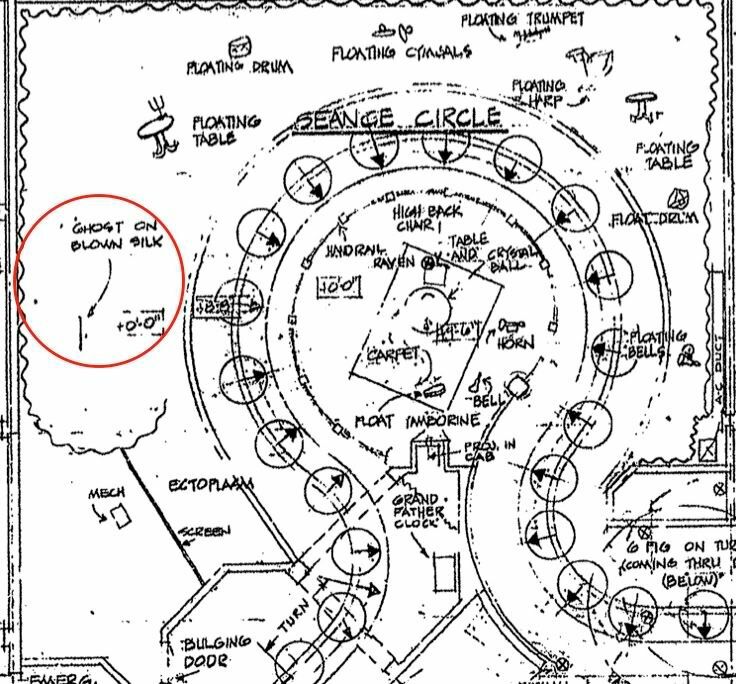 The hidden Mickey at WDW, incidentally, was not there originally. 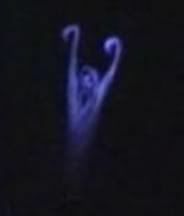 I have a pic of the original shrouded figure, and it looks a lot like the Séance circle purple guy. I don't know when the hidden Mickey one was put in. I'm not into that game at all. I think I mentioned too that the arm posture of the spirit in the crypt doorway is meaningful in mythology and archetypal symbolism, signifying "as above, so below" or, more commonly, "on Earth as it is in Heaven" — a rather appropriate stance, considering all of the lively, otherworldly activity taking place within the structure and grounds of The Haunted Mansion. 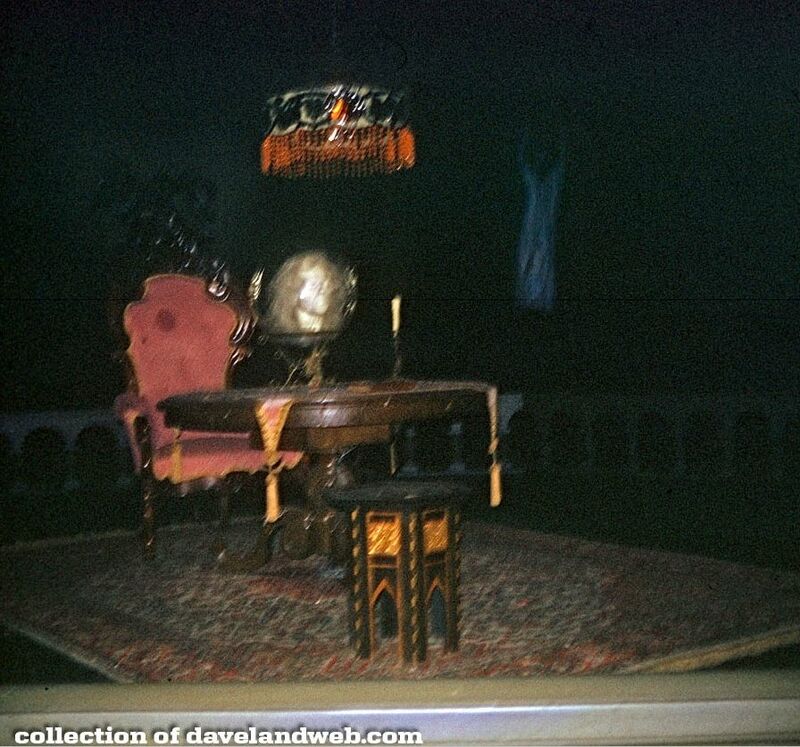 Wasn't it you who stated that the original Imagineers had decided collectively to keep religious symbolism out of The Haunted Mansion attraction? They come awfully close with the decoration above the crypt door, which looks like a stylized chalice with host above and sprigs of a plant akin to wheat on either side. While it's not exact, it's VERY reminiscent. I think it's a stylized urn. Urns + willow twigs are VERY traditional funerary decoration. The twin handles make it difficult to interpret a chalice, IMO. It appears that I need to put on my spectacles, before commenting on some of these things. Also, I think he looks like (when his arms are raised) various false ghosts revealed to be trees (one of them in Snow White, and one in "The Adventures of Ichabod and Mr Toad" from which I have a picture: http://cdn.culturemass.com/wp-content/uploads/2013/10/sleepy2.jpg) and also other ghosts looking like that in the "Night on Bald Mountain" segment of Fantasia. Then, it would be possible that Purply Shroud is remaining from the early versions of the ride that were connected with "The Legend of Sleepy Hollow" and other previous movies. Love your blog! I just finished this particular article and I wanted to mention that WDW still DOES have their "Purply Shroud", although I do believe he is more of a fluorescent green in lieu of purple. Just rode HM last week during the "Not-So-Scary Halloween Party" and he was indeed there. I'll be sure to take pictures next time and donate those to you. 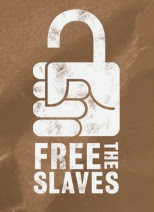 Again, love the blog! Thank you for all the hard work you've put into it over the years! Unfortunately, I've only discovered it recently but have been binging on it for days! If he's back at WDW, I'll be eager to see it. Definitely! My significant other is a WDW cast member, so I'm very fortunate to be able to get into the parks free of charge. We'll definitely be visiting more frequently as the cooler weather sets in, so I'll snap a photo for you the next time we go!